We are delighted to announce that 12 King’s Bench Walk has been shortlisted for Personal Injury and Clinical Negligence Set of the Year in The Legal 500 Awards, and a big congratulations to our Director of Clerking Oliver Parkhouse, who has been shortlisted for Senior Clerk/Chief Executive of the Year. The winners will be announced at the awards ceremony on 6 February 2019. 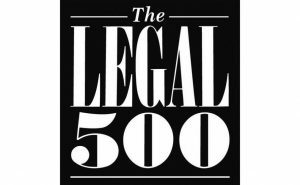 To see all of the nominations for The Legal 500 Awards 2019, please click here.